News received about departing of Most Worshipful and Revered H. H. Sri Swami Sahajanandaji Maharaj, is simply shocking. He was no ordinary person. He lived most simplest way and was simply divine and with heavenly personality. Sri Swami Sahajanandaji Maharaj was divine Gem of The Sivananda’s kingdom and radiant star of His divine Galaxy. We were fortunate to host him at Gujarat in the year 1974 at grand and memorable Divine Life conference at Dhangdhra. That was really a unique confluence of Sivananda family. Most Worshipful and Rev. H. H. Sri Swami Chidanandaji Maharaj, Srimat Swami Krishnanandaji Maharaj, Srimat Swami Madhavanandaji Maharaj, H. H. Sri Swami Sahajanandaji Maharaj, Dr. Swami Hridayananda Mataji, Yogiraj Swami Bhumanandaji Maharaj, Yogi Swami Manuvaryaji Maharaj, Maha Mandleshwar Swami Ganeshanandaji Maharaj, Maha Mandleshwar Atmaprakashanandaji Maharaj, Swami Asheshanandaji, Swami Adhyatmanandaji, Swami Ananda (Tatwala Baba), Dr. Sivananda Adhvaryooji, Br. Vishnu Chaitanya and many more were present on one stage at a time. We have experienced Sri Swami Sahajanandaji Maharaj’s tenacity towards his mission of Service to the Sivananda literature. His hard working and strict discipline to the core and confinement to his divine Gurudev and his mission were simply unique. He was incomparable. His departing is the loss not only to the global Sivananda family but to the printing technology as well in the global family of people aspiring to have excellent printing. 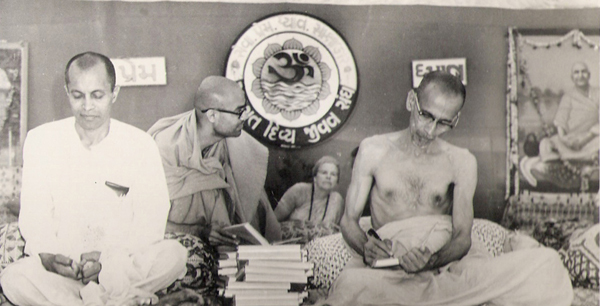 Brahmalin Srimat Swami Sahajanandaji Maharaj was unity in unity. He had no diversity. He was Yogi of synthesis of yoga. He was indeed an abode of Sivananda’s teachings; specially one can observe all 18 virtues of eighteen Ities sung by Gurudev Sri Swami Sivanandaji Maharaj. His "Ganga Talao" at the Divine Life Society of South Africa, Durban, his compilation of 18 Volume of Science of Yoga, Gospel of Sivananda and his editing of Rev. Gurudev’s literature will be cherished by lovers of Sivananda literature for ages. We pray for continuity of his divine grace from his heavenly abode. He was "ajatshatru" monk having no enemy. He has merged in the absolute Bliss of Sivananda Abode, will ever shine like North pole (DHRUV) star for ever and ever.